It is specially designed for professional astrologers and persons who want to start a business in the field of astrology. It is available in Hindi, English. User can upgrade the package any time. The best astrological software LeoTouch Professional has brought revolution in the field of astrology by making it reach to common man. Its market value lies in its credibility. The reason behind its popularity is its accuracy. It really helps astrologers to get most accurate calculation by just a click and saves their time. This astrological software contains complete Astrological Calculation with Remedies, Predictions, Various Charts, Dashas etc. Available in Hindi and English with modules Astrology, Matching, Varshphal, Numerology, Horary, K.P, Lal Kitab, Muhurat, Panchang, Books, Calendar, Transit, Mantras and lots of other useful informations. This is perfect business tool for professional astrologers. 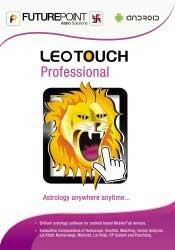 LeoTouch Professional astrological software is based on accurate astrological calculations. This astrological software is the result of years of extensive research work. You can use it easily with the little help of somebody as it is simple and user friendly. According to astrologers it is the easiest astrological software in the world. One can get most accurate, excellent and comprehensive results from this software. KP horoscope, planet/house position, significators, 249 no. System, Vimshotri Dasha. Lal Kitab module gives Lalkitab Kundli, Dasha, Debts, Varshphal, Remedies & Predictions. Root number, destiny number, name number calculations with remedies & predictions. Muhurata for Job, Business, House Warming (Grah Pravesh), Marriage etc. This is a unique software containing great features in it. It contains Astrology, Matching, Varshphal, Horary, KP, Lal Kitab, Numerology, Muhurat, Panchang, Gochar(Transit) and Mundane in Hindi, English language. It also incorporates Sagar Chakra, Mantra, Tarot and Ramal. Astrologers can use these systems too. Astrologers can easily customize it according to their needs. Kundli, Dasha and Lagna chart can be used as per required convenience. LeoTouch is best answer to get accurate horoscopes instantly. There doesn’t remain any possibility of any illusion regarding the degrees and placement of planets. It is specially designed for professional astrologers and persons who want to start a business in the field of astrology. It is available in languages like Hindi, English. User can upgrade the package any time. Table - Contains all important tables used in astrology like avakhada, ashtakvarga, numerology, mundane, varshphal, lalkitab table etc. Horary - Calculation and detailed answer of questions on the basis of horary astrology. KP - K.P. Horoscope, Planetary and house position, significations, Calculations of 249 number systems, Vimsottari Dasha. Lalkitab - Planetary Position, Prediction, Lal Kitab Dasha, Debts, Remedies, Annual Horoscope with Yearly Predictions and Remedies. Muhurat - Muhurta for Job, Business, House Warming (Grah Pravesh), Marriage etc. Mundane - Kundli software LeoTouch Mundane gives predictions about national and international affairs. Prediction - Navamsa/House/Planet/Dasha & Gochar Reading. Transit – transits till 9999. Astro Graph - Health, Finance, Emotion -Daily, Weekly, Monthly,Yearly, 10 yearly. Most accurate and authentic astrological software. Dasha systems of 10 types – Vimsottari, Yogini, Char, Ashtottari, Tribhagi, Kal Chakra, Sodashottari, Shatabdika, Panchottari & Dwadshottari. Vimshotri Dasha upto 5 level. Exhaustive Computations of Horoscope, Varshphal, Matching, Horary Analysis, Lal Kitab, Numerology, Muhurat, KP System and Panchang. Supports various Ayanamsa with a facility to add user defined Ayanamsa. Permanent backup for all things done. Horoscopes can be kept in different categories like sportspersons, politicians for research work. Leo Touch already contains birth details of more than 5000 celebrities like film stars, sports persons, politicians, world leaders, musicians and stalwarts of other fields. Language can be changed as per choice. There is option of using Neptune, Pluto and Uranus as planets in chart. Contains a data of longitude and latitude of 1 Crore cities. Facility of viewing many horoscopes at one time. Detailed panchang with Lagan, Tithi, Nakshatra, Yoga, Karan, Rashi, Rahukaal, Bhadra, Panchak, retrogression, Gandamool. Facility of viewing many packages at one time with different tab. Various tables like planets, gems, planet friendship, planet significator, yoga table, Nakshatra- Gana/Nadi, Rashi-Vashya/Paya tables, Nakshatra-Lord/Alphabet tables, Hindu/Sikh/Jain festivals. In LeoTouch, you can customize the color and font style. Contains all Indian calendar with Sunrise, Paksha, Nakshatra, Tithi. Horary Tools such as Biorhythmic Chart and Tarot Cards. Study Material on Astrology, Vastu, Numerology, Palmistry and Lal Kitab. Transit - Graphical view to see and analyse planets and their positions. Transits till 9999. Prediction - Navamsa/House/Planet/Dasha & Gochar Reading with 30 year prediction. Yogini, Lagna, Chalit, Navamsha, Dashamsha, Moon Chart, Ashtak Bindus Chart, K.P. etc. Reading Material for Palmistry, Numerology, Vastu, Astrology, Kalsarpa Yoga, Analysis of Mangal Dosh. Various Horary Tools such as Tarot Cards, Gautam Kevli Mahavidya, Ram Shalaka etc. The Bio-rhythm Chart is a useful feature for knowing the ups and downs of Health, Finance and Emotions. A useful aspect is incorporation of various books of astrology that are fit for regular consultation. Remedy – Gem selection on the basis of Dasha, specification of metal, finger. Wearing gem on the basis of planet and Nakshatra. Mantras for Grahas, Sadesati. Articles of planets for donation.